The debate goes on: should states retain the difference between the minimum wage for so called “tipped workers” and other workers or not. The majority of cities and states have retained the lower minimum for tipped workers, but there has been a recent wave of cities and states eliminating the lower minimum and insisting all workers receive the same minimum wage. We all need to know what is going on in this space because this debate does not seem to want to go away and the consequences are real for restaurants as well as customers. New York is the latest state exploring whether to raise the minimum for workers who earn tips. Just this week, Washington DC voters narrowly passed a bill to eliminate the lower minimum tipped wage for restaurant employees. The change will be phased in over several years. The current minimum for tipped workers in DC is $3.33 per hour. Each year between now and 2025, $1.50 will be added to that minimum until those workers receive the full minimum wage of $15.00 per hour. While many workers in DC are thrilled to see the increase, many are also concerned that they may earn less than they do with tips and restaurant owners are concerned about how they will absorb the increased wages. Last year, Minneapolis eliminated the lower tipped wage and those wages are also increasing every year to get to the full minimum. The city Mayor even sang a song demonstrating his passion for raising all wages to the higher minimum. Check it out below. 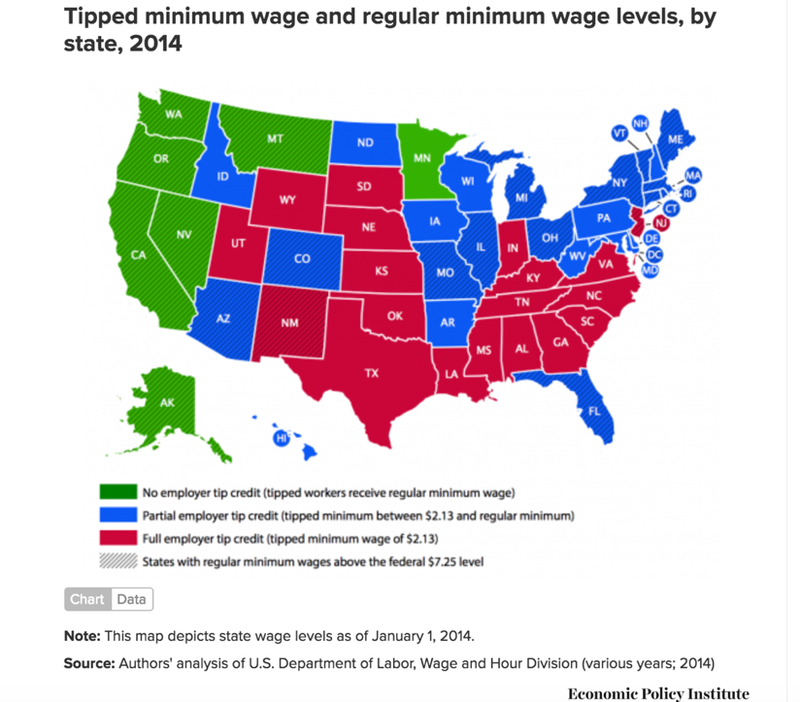 Here is map done by the Economic Policy Institute of the variance in minimum wages for tipped workers across the US. There are a couple of arguments behind the push. One is that it is unfair to require workers to rely on tips to make up their wages – that it is too arbitrary and fluctuates – that they ought to be ensured a living wage with or without tips. Those in favor of raising the minimum wage for tipped workers argue that waiters and waitresses should not have to depend on tips – the kindness of customers, or what shift your boss gives you – in order to make a living wage. The other argument is that there is too great a disparity between the front and back of the house workers – that front of the house makes far more than back of the house workers through tips, while back of the house workers are stuck with minimum wage. The concept is – if you can raise the minimum wage for tipped workers, then, by raising prices to compensate for the lost tips, you can pay everyone, including the back of the house better, attracting and retaining back of the house staff better, while keeping front of the house workers whole. On the surface, it may seem like a no brainer to argue that tipped workers should at least see an increase to bring them closer to where the federal minimum wage is. Tipped workers in most states receive a far lower minimum wage than do other employees. Sounds unfair on the face of it, right? We can all agree that people should be able to earn a decent living wage. And why should one set of employees in the same restaurant be paid completely differently than the back of the house? With that argument in mind, the New York legislature is looking into raising the minimum wage for tipped employees. And, according to the New York Post, in March sixteen Hollywood actresses including Jane Fonda and Sarah Jessica Parker signed a letter to Governor Cuomo in support of the change. Of course, the idea is that tipped employees make up for it in tips. And most do. In fact, the law requires employers to make up the difference to employees who don’t earn at least minimum wage after tips. And for those employers who take advantage of the “tipped credit” (allowing them to pay less to tipped workers), they are not allowed under federal law to require those employees to share tips with the back of the house employees. So, I think it is fair to say that we would all like our employees to making a fair living wage – including the “tipped workers.” But that is where the agreement ends. The question is HOW to make sure tipped employees can earn a decent wage while ensuring that it doesn’t hurt restaurants too much and customers will keep coming. Based on my research, there isn’t much actual data on what happens if you increase the minimum wage. The arguments against the increase boil down to three. Increased cost has to go somewhere: The first argument is that raising the minimum wage for wait staff adds to the cost of operating a restaurant in a world where margins are already paper thin. So, this argument goes, the restaurant has to pass along the cost somehow – either by adding a service charge to the bill or by increasing menu prices. The fear is that, if you add a service charge or drive up prices – or some combination – you drive away customers. Minneapolis is a good example of exactly that. Once the lower minimum tipped wage in Minneapolis was eliminated, a number of restaurants experimented with adding a service charge to make up for the lost tip revenue. According to the Minneapolis Star Tribune, many restaurants saw real backlash from customers and reverted to optional tipping. The tipped workers don’t actually make more money and might even make less: The second argument against increasing the minimum wage for tipped employees is that, despite your best intentions, those workers won’t actually make more money. The idea is that, rather than having the new minimum wage plus the tips they are used to earning, customers will tip less – knowing that their server’s wages have increased – so the wait staff will end up either where they were before – or potentially worse off. Lost jobs: The other argument, stemming from the above, is that restaurant owners will be forced to find ways to lower their costs, either through automation of some functions or through reduced staff or both. New York is hardly the first state to look into this. Utah also recently considered and rejected similar bills after lobbying by the Utah Food Industry Association and by small businesses who were worried about how they would absorb the increased costs. In March, the Utah legislature rejected a bill to raise the minimum wage for tipped workers to $3.25 from the current $2.13. A similar bill in 2015 also failed. Maine passed legislation to raise the minimum wage for tipped employees in 2016. Just one year later, the Maine legislature back tracked – overturning the 2016 change in response to a concerted campaign by restaurant workers – who argued that they were getting not more but less money because customers were tipping less knowing that workers were getting a higher minimum wage. So, we will see where New York ends up. DC and Minneapolis will also be interesting test cases to watch to see how it plays out in reality: whether the affected workers actually do make more or less money; how customers react; and how restaurants deal with the increased cost – either by adding a service charge, by charging higher prices or some combination of the two. Should Tipping be Eliminated All Together? A more radical school of thought – stemming from the debate about tipping and the minimum wage floor for tipped workers – argues that tipping should be eliminated altogether. Tipping, some argue, is an arcane practice going back to old English aristocracy practices of tipping the servants of those whom you stayed with. The anti-tipping movement points to evidence that tipping is inherently biased, along racial, gender and age lines. They argue that restaurants workers should be treated like any other profession – paid with a wage and not tips for service which may be very arbitrary. Anyone who has traveled abroad has experience the jarring – for an American – experience of realizing that you are not supposed to tip – at least in the fashion we are used it. In Europe and many other countries, you are charged a service fee and expected to leave – not the 20% we are used to – but maybe 5% on top of the bill to express your thanks for a good meal. So why is the US so wed to tipping? And should we evolve? Who knows. The short answer, in my view, is that it would be very hard to change this in the US mostly because of the ingrained mentality of customers. Customers like the idea that they get to reward good service and punish bad service. And customers don’t generally like the idea that the waiter or waitress gets paid regardless of how the service was. (Although the irony is that apparently most people tip in the 15% range regardless of service). Further, customers worry that waiters who aren’t looking for tips will have a bad attitude. Union Square Hospitality group in New York was one of the first major restaurant groups to implement a no tipping policy in 2015. To make up for the lost tip revenue, they added an 18% service charge across the board. Union Market argued that by adding that service charge, they could pay the back of the house workers a better wage and not affect customer service. Union Market said that they had an easier time hiring chefs after the change. In response to people concerned about the service they would receive, Union Market argued that customers should let management know on the spot about their experience for an adjustment. Marco and Amy acknowledge that finding professional servers in Salt Lake City, ready to embrace the Italian custom of no tipping hasn’t been easy. But they have proven that patience and ongoing training pays off. VENETO has had a core team in place for almost as long as they have been open. And they continue to slowly add others who are excited to join their growing team of professionals and committed to refine their craft of Italian fine dining service. The fact that there is no mark-up reflected in pricing on their menu, as well as no tip line on a guest's bill, shows how serious Marco and Amy are. That, plus the fact that when customers do leave a little extra, VENETO donates this money to local charities. To date, VENETO has donated $3800 to The Cancierge Foundation, an organization dedicated to providing services for cancer patients’ needs. This year they are donating all tips left to The Danielle Byron Henry Migraine Foundation, whose mission is to provide support and access to treatment for those living with migraine disease, especially young adults and children. Beyond staying true to a fully authentic Italian dining experience, The Stevanoni's see donating the non-necessary tips as a simple way to give back to the local community. For those are interested in more, here is a list – linked from Reddit – which lists restaurants across the country who currently have a no tipping policy. "Our customers and staff spoke very loudly [about the policy], and a lot of them voted with their feet," he said. According to the CNN report linked below, although the chain raised prices to make up for the lost wages in tips, Merritt said 60% of their customers simply did not like the new policy – questioning whether the restaurant was actually passing the money along to servers and not liking their inability to reward or punish service. They said they lost between 8-10% of their customers. Thad Vogler – owner of 2 restaurants in San Francisco also tried it and moved away from it – he said he was losing servers to other restaurants that had tipping policies. He raised prices across the board by 21% and gave raises to worker in the back of the house but found that it was the front of the house that was unhappy. And, according to an article in Grubstreet, the Union Square Hospitality Group, which implemented the no tipping policy with great fanfare has struggled with it, losing significant staff along with the policy. They have stuck with it, however, and believe it will take time for customers to get used to it. So, in short, the debate over raising the minimum wage for tipped workers as well as the debate on whether to take the even bolder step of eliminating tipping altogether goes on. Based on what we have seen to date, it will continue to play out on a case by case and state by state basis.